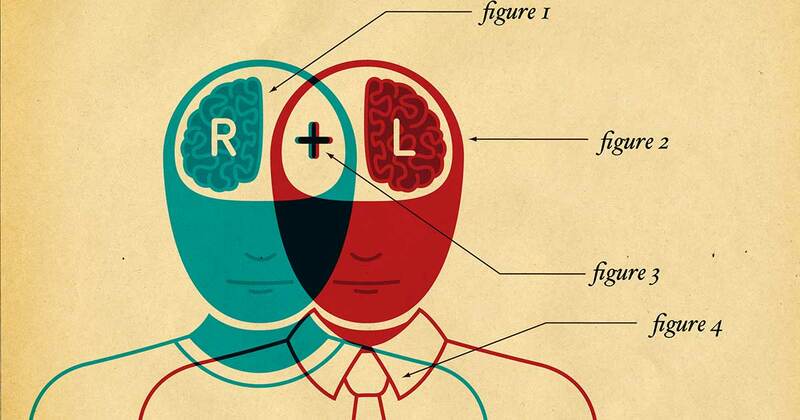 Liberal's and Conservative's Brains Are Different on Average - Fact or Myth? Studies have shown that Liberal's and Conservative's brains are different, both biologically and psychologically, on average. Do Liberals and Conservatives Think Differently? Do Liberals and Conservatives Have Different Brains? Below we look at the many studies that have looked at the neurological, psychological, and biological differences between people with different political ideologies and moral compasses. Keep in mind these are peer-reviewed studies (typically with less than 100 participants each), so while the science is notable enough to be published, more studying needs to be done, and nothing is written in stone. Also, keep in mind that what is true for a group on average is not necessarily true for an individual. Also, keep in mind humans are complex and can hold a variety of stances on a given issue and those stances can evolve over time. Simply put, when looking at the data below we want to consider it as interesting neurological and social science that gives us insight to populations, not gospel truth that tells us about specific individuals. How Are Conservative And Liberal Brains Different?. This video looks at this study: Differences in negativity bias underlie variations in political ideology. This study focuses on psychological differences, the video and studies below looks at biological factors like brain size and genes. With the above noted, and while noting that the research done is far from absolute evidence, some studies have found biological and psychological differences between people who identify as American-Conservatives (“right” / Republicans) and American-Liberals (“left” / Democrats). These differences include a difference in the size of brain regions, differences in genes, differences in thinking styles, and importantly differences in morality and ethics. How Genes Determine Your Political Views. This video looks at Genopolitics from a centered perspective. Check out this video from the Manhattan Institute on the same subject. Importantly, one study of 90 healthy volunteers, showed biological differences include an enlarged anterior cingulate cortex in liberals and an increased right amygdala size in conservatives. Conservative brains are more active in declarative and episodic fact-based memory and negative emotions like fear. Liberal brains are more active in terms of emotional awareness and empathy. The implications of these differences are further explained here and in the videos below. Another study here used different methods and looked at different research, but concluded the same general thing regarding character traits. Liberal vs. Conservative: A Neuroscientific Analysis with Gail Saltz. This Big Think video explains some of the most recent research on the brain and political leanings. This is the “academic liberal” perspective. This video looks at this study (the one we note above on the biological differences) Political Orientations Are Correlated with Brain Structure in Young Adults. FACT: Liberals and conservatives don’t just have different ways of seeing the world, their brains usually looked different under an MRI. It seems that using just brain imaging alone one can guess whether a person is liberal or conservative with about a 60- 70% accuracy (see the Political Orientations Are Correlated with Brain Structure in Young Adults study for exact figures). What don’t we know? We don’t know what biological differences are in the brains of those who consider themselves independent, and we don’t know if this is nature or nurture (if people are born this way, or if using a thinking type enlarges part of the brain). Red brain, blue brain — the neurobiology of political values | Hannah Holmes | TEDxDirigo. One last TEDx video on the subject due to the science being young. Another study explained in the video below, looked at moral differences between liberals and conservatives. The study looked at five moral factors: purity, in-group, authority, fairness, and harm, and consistently saw those who considered themselves conservative to care more about authority, a tigh-knit in-group, or tended to favor tradition and purity. See the video for details. The moral roots of liberals and conservatives – Jonathan Haidt. This video looks at the moral differences between liberals and conservatives. TIP: When we say liberals and conservatives we generally are talking about the American meanings of these terms (which is important as “liberal” has a unique meaning in modern America). The studies noted on this page are based on how people identify themselves. So “liberal” is modern Democrat (social-liberal) and “conservative” is modern Republican (libertarian-conservative-social conservative). With that said, each study is different and each individual understands the parties and political leanings in a different way. See the basics of the political parties, our model of the left-right spectrum, or our history of liberalism (which is also the history of conservatism). How Morals Influence If You’re Liberal Or Conservative. Another look at how left-wing-brain right-wing-brain (in terms of politics) affect morality? How does it relate to biological differences? This video takes a look. The above studies and other peer-reviewed studies that look at political ideology, thought process, and brain structure listed in the citations below don’t suggest one type of brain is better than the other, but they do seem to suggest that the old “right brain, left brain” adage has some weight to it. The studies show that liberals and conservatives favor a type of thinking, not that liberals and conservatives had completely opposite views. For instance, a conservative may be more likely to favor their in-group and view it as traditional, while a liberal might be more likely to think of their in-group as having new experiences. See Here’s What Science Says About the Brains of Democrats and Republicans or Differences in Conservative and Liberal Brains – 2016 for more in-depth looks at left-brain-right-brain studies in regards to politics. TIP: Neither you nor your uncle is actually “crazy” based strictly on your political views. Rather, each is taking a rational view based on their hardwiring and soft-wiring. We must learn to respect and understand each other’s arguments and why certain issues are important to others. That means respecting individuals on their own merit and as part of the groups they indentify with (more than what we indentify them as). The Science of Political Orientation. Let’s end with a lecture from Berkley Center. Conservatives and liberals don’t just have differences in thinking, they seem to have biological and genetic differences too. Arrogating all the studies on this page, i’m left with the conclusion that we are hardwired to be left or right, and “soft-wired” from our families, friends, cultures, and media. Our neuroplasticity plays a role, shaping us, but it seems we have power over the process. The obvious and simple takeaway is that to be effective you must be able to use your “left-wing” and “right-wing” brain, you must use your liberal empathy to step into the shoes of a conservative, and you must use your conservative flight or fight and fact-based thinking to understand why liberal-style empathy is important. It seems the left and right both hold a key to the puzzle, sure it is tempting to fight, but a little bit of peace, love, and understanding might just yield better fruit. If it’s a fact that conservatives and liberals are hard wired differently, how do you explain the fact that people generally become more conservative as they age? Brain doesn’t change, but opinions do. The brain actually does change as we grow, changes throughout our life. this is called neuroplasticity (see http://factmyth.com/factoids/thoughts-can-rewire-your-brain/). I don’t know what would explain changing political views with age, but it is a great question and something to look into. Also to be clear, just because lots of studies point to differences doesn’t mean we know this for sure. Each study is like a clue, it points to a truth, but it isn’t absolute fact itself. As we age, we tend to become more frail, more fearful… thus… conservatism… not always the case, but often the case. That is 100% true. Conservatism in its non-political form. That is, budgeting, not taking big risks, and generally “not being a little punk” and “being responsible” is a sort of wise conservatism that comes with age (and likewise being young and rash has a liberal quality to it). This is different than political social and classical liberalism and conservatism, which is what the article is about. I would not connect that type of conservatism that comes with age with either party in general, but instead would connect that with some longstanding Senators and figures in government of both ideologies (liberal and conservative) who focus on duty in a responsible way. That is, it is an advent of experince and age, that both A types and B types are privy too. That is my opinion on the matter at least. “utilizing a thinking type”. How about “using a thinking type”? Utilizing something is to use it for a purpose that was not originally intended. “I utilized my laptop as a doorstop” is correct. “I utilized my laptop to check my email” is not correct. Good thoughts. Thank you for the suggestion. The Hannah Holmes vid forgot to mention that liberals tend to be more courageous, have higher IQs and is less likely to fall for scams aka general B.S. and the farther left the progressively more this is the case. I would love that to be true, but I would certainly need to see a citation and consider the study. I would wager that it would depend on things like the type of scam and the type of situation that took courage. I’ll research what you say and see what I can add though! Only issue I have w/ the article is that Republicans tend to NOT believe science, they discount science, and tend to reject ACTUAL fact for imagined ‘fact’ (the ‘alternative facts’ meme). So the insistence on “conservative flight or fight and fact-based thinking” is erroneous. Conservatives, on the whole, are more fear-based, liberals I know are more fact based, though, certainly they do have more empathy on the whole. I’m just tired of the wusses getting the credit for being rational, when they are only so if one buys into their ‘version’ of reality. They are the emotional ones. Liberals are only emotional in political decisions when empathy (not fear) is involved. Interesting thoughts. Thanks for sharing. I’ll let your thoughts stand on their own merit and offer some of my own insights in the comment form. Insights: …. One thing I’ll say is that after reading “the google memo” I want to stress that when we talk about the inate differences of left and right and women and men (or any two naturally occuring, different and generally equal but not exactly the same groups), we want to think of this as “on average for a population” and not “as it applies to an individual or specific group.” It is almost more toward being a metaphor or model to explain what is rather than being what is. This is true even when we have social science data to back up claims. It is something we want to approach as both a idealist and realist, with empathy and rationalism, from a liberal and conservative view, etc. Also I would stress that things are complex, in very general terms the right may tend toward specific qualities on one issue and the left may tend toward those very same qualities on another issue. So take fear, yes the right may tend on average to have a fear of others and respond by voting for trumpian policies on immigration for example, but the left has just as much fear of the trumpian policies as the right had fear in the first place (speaking very generally, with evidence being “what we see in the media and in social media commments” for example). Think there is a lot to consider and uncover to better understand the political human condition, political emotion, and implicit and explicit bias and how we can make democratic, republican, liberal, and conservative principles work in a representative democracy… In words, it’s about how we make a culture work with naturally different types, not how we can demonize a natural occurring ideology and exclude or reform it (in general, in some instances we do need to temper qualities that when unrestrained can be damaging, like fear or aggression unrestrained). Going back to pure idealism and the root of modern western philosophy, consider Plato’s republic. It is a giant metaphor for tempering the natural qualities of humans in the political realm to ensure bad qualities are restrained and good ones are ensured via a smart social structure (for the benefit not just of the collective, but if each individual). Now I don’t think Plato’s solution was perfect, but the gist works as loose metaphor. In a family (consisting of a man, woman, and child) the woman isn’t more or less important than the man, and the child isn’t more or less important than the parent, they are all just equal but different parts of a family with different qualities. Meanwhile we generally recognize a give modern family can shift roles and break stereotypes and that is normal and natural too. Still, the each member has some roles that most families embrace, for example rarely does the man give birth to a child or a child run the family, so there are some differences that apply on more than average that should be considered too (even if a given family breaks the mold in every respect). Still, to stress and restress this, we should never treat averages as applying to specific individuals. Instead everyone should be judged on their own merit. And that is a position by the way that pairs liberty, with equality, and individualism with collectivism (by collectively treating people equally in respecting their individual liberty). In other words, correctness is often found in pairing leftwing and right wing qualities. If it is our brains are different like the data suggests, then it likely is that tempering the powers of each is the best path for success. That is true for considering groups, and considering the natural dualities in ourselves. We have to be more like water and less like rocks on some issues. Or at least that is some philosophical insight into metaphysical moral alchemy in the sociopolitical sphere…. Loosely speaking to the social science above to offer some extra opinions and context. Today a liberal is anyone who understands facts and tells the truth.